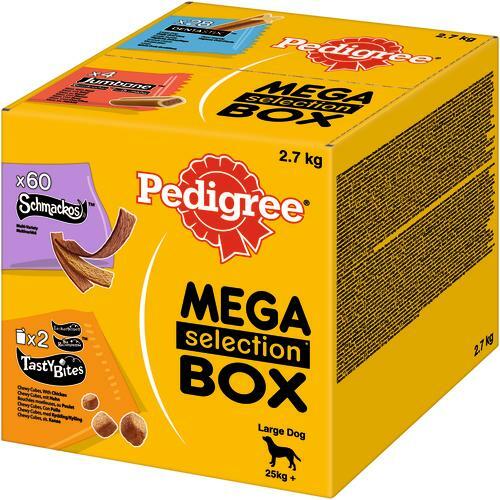 The Pedigree Mixed Variety Selection Box Large Dog Treats is a scrumptious bundle of yummy treats that's sure to set your large pooch's tail wagging! Within the selection box Pedigree have included a variety of tasty dog treats that come in all shapes, sizes and textures. All to keep dogs exuberant, the way we love them. This Mega Selection Box comes filled with 4 tasty variants your large dog is sure to love. 3 x Schmackos Meat Multi Variety 20 piece (60 Chews) - Soft and scrumptious Schmackos dog treats are full of flavour, tender strips that dogs adore. Feed whole or tear into smaller pieces, either way you’ll be treating your dog with the thing he likes best. 4 x Dentastix Large Dog 7 stick (28 sticks) - Pedigree Daily DentaStix are uniquely X shaped dental sticks that are scientifically proven to help reduce tartar build-up by up to 80%, when fed daily DentaStix are designed to be chewed for long enough to be effective, with a gently abrasive texture and active ingredients that help to reduce the build-up of plaque and tartar. Tasty but low in fat, with no added sugar and free from artificial colours and flavours. 4 x Jumbone Beef Large Dog 1 piece (4 chews) - Deliciously satisfying and long-lasting dog treats for your dog. It cleverly combines a tough chewy outer with a delicious soft centre - something your dog can really get his teeth into and tastes fantastic too. For dogs that love to chew. 2 x Tasty Bites Chewy Cubes with Chicken 130g (260g total) - Dogs love to be rewarded, so here are a range of tantalising tasty bite-sized dog treats that come in many shapes and varieties. Great for big and small mouths, they are the perfect way to treat your dog. Delicious dog chews that contain no artificial colours or flavours. DentaStix dog chews are scientifically proven to reduce tartar build up by up to 80% when fed daily.